Quebec has always been a special province of Canada. It has turbulent history of colonization and war, where religion and language played a major role. It was known for doing things in a different manner. Its approach to immigration has been different. Here we are presenting a few recent updates about Skilled Worker Program of Quebec. In the recent years, Quebec has experienced a big arrival of immigrants who are ready and enthusiastic to work in the province. They have a desire to share its culture and also learn something new. The increase of immigrants in the labour force boosted the economy of the province. 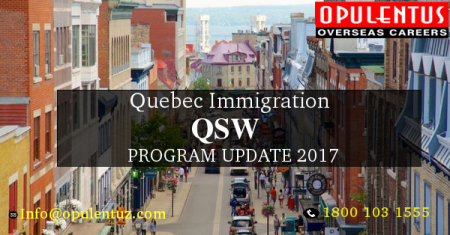 The Quebec Skilled Worker Program played a major role in it. Quebec was popular among the immigrants and the program had a huge backlog of applications. The Quebec Skilled Worker Program has two application streams. When a candidate is eligible to submit application from within the province, it can be submitted at any time, and it will receive precedence while processing. On the contrary when a candidate is not eligible to submit an application from within the province, a wait for the intake periods of the program is needed. The application adds to the backlog in this case. The Quebec government announced that measures are being taken to start working on online applications which were submitted through the Mon-Projet-Quebec portal online. There is a trend to keep up with mobile access and compatibility, and the Mon-Projet website has become more user-friendly. It is robustly facilitating more actions. Candidates are in a position to update contact information, add /remove personal relationships, and can change the academic credentials, or any information about relatives living in Quebec besides adding more information. This initiative began in the summer of 2017. The information regarding the average time required for processing the applications given through Mon Projet is not yet available. It will be made known in the future. The backlog of applications submitted more than two years before is being processed. The Quebec Selection Certificate has undergone several important changes. There is a change in the number of acceptable applications in the present intake period. Moreover there are changes in the persons who can submit applications during any time, or the number of applications allotted to self-employed workers, entrepreneurs and investors. The aim was to improve the immigration system of Quebec. Modifications have been made to the selection grid of skilled workers to strengthen the immigration growth. The important change was made in the categories of Areas of training and the Education level. In some areas points given for training have been increased, or reduced. Candidates must seek a review to make the most of their chances to be accepted in Quebec as a skilled worker. If a candidate is interested in Moving to Canada we are happy to offer the best guidance and tips for success.fill out a free evaluation form or contact us at [email protected] or call us 1800 103 1555. One of our experts will meet your expectations and provide answers to queries.